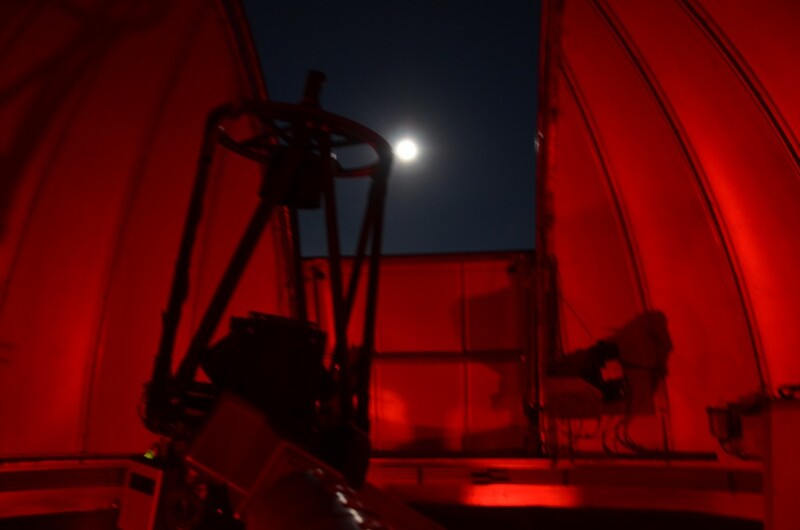 Many months of time and effort were spent calibrating and adjusting the observatory equipment to make image acquisition and automation more efficient. After the mount and telescope were installed, the mount was polar aligned and then periodic error correction was recorded and implemented in the Paramount ME. Periodic error correction was tested in both PEMPro by CCDware and ProTrack by Software Bisque. After adjustment, the overall periodic error of the mount was reduced to less than 1 arc second peak to peak. The raw periodic error data collected by PEMPro is shown to the right. The periodic error curve fitted by PEMPro is also shown to the right and indicates periodic error of less than 1 arcsecond peak to peak. The average seeing at the observatory is slightly above 1 arcsecond, and therefore, the periodic error is “lost” in the seeing. The SKY X planetarium software includes a software component called ProTrack that is tightly integrated with the Paramount ME. ProTrackcreates a set of points across the sky and slews the telescope to each point. An image is taken at each point, plate solved and compared to where the telescope “thinks” it is pointing. Pointing errors are solved across the entire sky at each point creating a pointing model that corrects for any errors in telescope pointing. The result is that when the telescope is commanded to slew to a particular point in the sky, the image will be precisely centered on the imaging chip of the camera. The pointing error is approximately 10 arcseconds across the sky, which is less than the diameter of Jupiter. This means that the telescope operator can “mouse-click” on any object in the SKY X planetarium software, the telescope will slew to that position and the object will be precisely centered on the imaging chip. The ProTrack pointing results are shown to the right. One of the benefits of a robust pointing model is ProTrack’s ability to utilize the model to make adjustments in the Paramount ME’s right ascension and declination servos to accurately track the telescope with a high degree of precision. The telescope focal length is approximately 3,600mm and even at that length, the Paramount ME with ProTrack can take unguided images for up to 10 minutes without any auto-guiding at all. A ten minute unguided image of a the globular cluster M13 is shown to the right. The SKY X planetarium software controls the dome through the ACE Smart Dome interface. The SKY X software includes the Dome Add On that controls the dome. The Dome Add On must be properly calibrated with the actual dome geometry so that the dome will line up correctly with the Paramount ME mount. The set up page for the Dome Add On with the parameters is shown to the right. The observatory uses FocusMax to focus the telescope. FocusMax interfaces to the telescope control unit and the secondary focuser through the ASCOM interface. FocusMax has to profile the focusing system by generating V-curves. The FocusMax profile for the telescope is shown to the right. A FocusMax focusing run is shown to the right. CCDAutopilot has a unique feature that automates determining the correct RGB combine ratios for the color filters. CCDAutopilot does this by selecting a G2V type star and then takes several exposures through the different filters. The flux from each filter exposure is compared to determine the proper combine ratios with green equal to a standard of 1. The color combine ratios for the camera and telescope are shown to the right.